A light and refreshing way to start any meal. Prepare before and simply put together when you’re ready to serve. Mix all the cure ingredients together in a bowl. Lightly dust a baking tray with the cure mix and then lay the salmon trout skin side down on the tray. Sprinkle the fish with the remaining cure mix, cover the whole tray with cling film and refrigerate for 2-3 hours. When ready to serve, gently wash off the cure mix and pat dry. Sprinkle the flesh side of the fish with the remaining fruit zests and dill. Using a vegetable peeler, peel the cucumber lengthwise in ribbons. Stop when you get to the seeds and then turn the cucumber around and peel the other side. Combine the water, vinegar and sugar in a saucepan and bring to a boil. Once boiled remove from the heat and allow to cool. Once cool to the touch, pour over the cucumber ribbons and leave to pickle until completely cooled. Just before plating, strain off the pickling liquid. Slice the fish at a slight angle as thinly as possible to get long thin slices. Lay slices onto serving plates. Creatively plate cucumber ribbons on each dish. 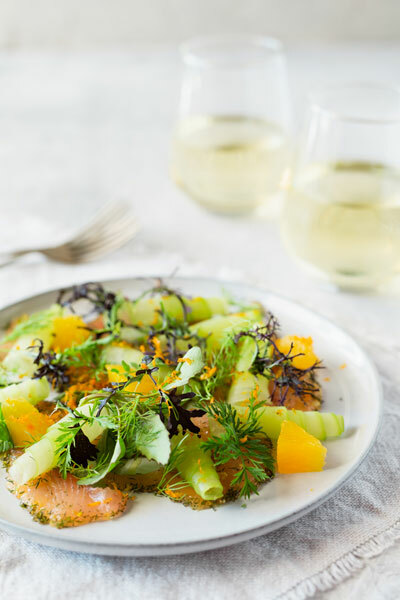 Top with small segments of cut orange, some microgreens and dill. Drizzle with dressing and serve.